How long can I evaluate before purchasing? Can I purchase this just for small team in my Jira instance? I have another problem with my license, can you please help? Log into your Jira instance as an admin (i.e. user has the Administer Jira global permission). Click Free trial to download and install Agile Backlog Tools for Jira. Your Backlog is a single, prioritized list of all of your team’s work. Unfortunately, Backlogs can get out of hand. They can turn into large wishlists that are hard to manage and the work that actually does need to get done might not have enough detail. Agile Backlog Tools will assist with these problems by providing you a variety of ways to highlight issues in your Backlog that require extra refinement or shouldn’t be there at all. Once you find those issues, you can start refining! Issues in your Backlog can become unhealthy. Some issues may not have been updated in a while. Other issues might not have a description, an estimate, a version or an epic assigned to them. In other words, your issues need refinement. 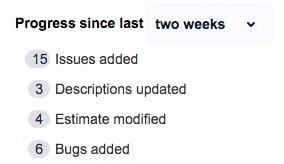 Any unhealthy issues highlights issues which are missing any of the following: description, estimate, fix version or epic. No description highlights issues which do not have a description. No estimate highlights issues that have not been estimated. No fix version highlights issues which have no fix version assigned. No epic highlights issues which have not been assigned to an epic via the ‘Epic link’ field. Stale highlights issues which were last updated over 90 days ago. Managing a Backlog can turn into a back and forth between dozens of tabs in your browser. This can be confusing and lead to an overwhelming amount of context switching. Is your Backlog full of issues you’ll never get to? With Agile Backlog Tools you can archive issues that haven’t been updated in a long time for later processing. Don’t worry, your issues won’t be deleted. They’ll simply move to a list at the bottom of your Backlog called Archive. From there, you can bring individual issues back to your Backlog. As you are refining your Backlog and highlighting different issues to focus on, these selections will be reflected in the ‘Current snapshot’ side panel in your backlog. 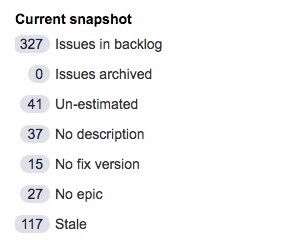 This is updated in real time and helps you to identify the current state of your Backlog. Backlogs are constantly evolving. The aim is to keep your Backlog relevant as time goes by, but sometimes the ball gets dropped when we’re overloaded or other priorities pop up. To see how your Backlog has evolved over the last week, two weeks or month, simply switch between the timeframe on the right of your Backlog. Agile Backlog Tools works off a number of key Jira configurations and set up conditions outlined below. 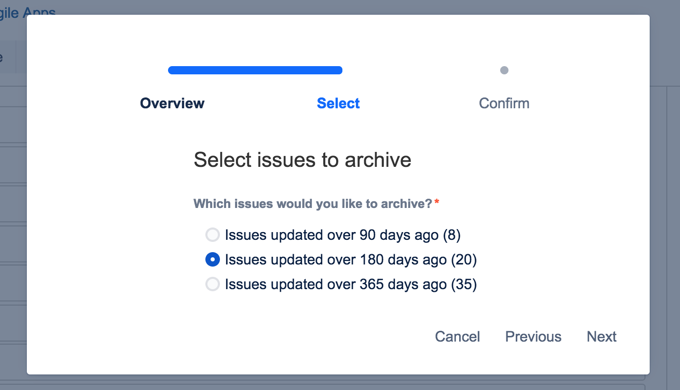 To use the Agile Backlog Tools (and all of its functionality) for a board in your Jira instance, you will need to have specific permissions set up for your Jira user account. Most of these permissions will come as default when you have access to a project and its boards in Jira. We currently support Scrum and Kanplan boards (Cloud only). Kanban board compatibility is in the works. See our pricing in the Agile Backlog Tools Marketplace listing. You can try the app with no limitations for 30 days, completely free. No. Atlassian Marketplace for Cloud apps uses Jira instance licensing. You cannot buy an app for a single team or a subset of your Jira instance. No worries. For any issues, let us know on our support page or send us an email at support@axisagileapps.com.